This food truck is not just any old hot dog cart. Rather than having you spend a dollar on a greasy piece of mystery meat, the Maille Mustard Mobile truck offers dogs that range from about $7 to almost $75. The truck is currently making its way around Australia, offering ridiculously priced wieners throughout the land down under. So what kind of hot dog is worth more than your rich uncle's most expensive bottle of wine? 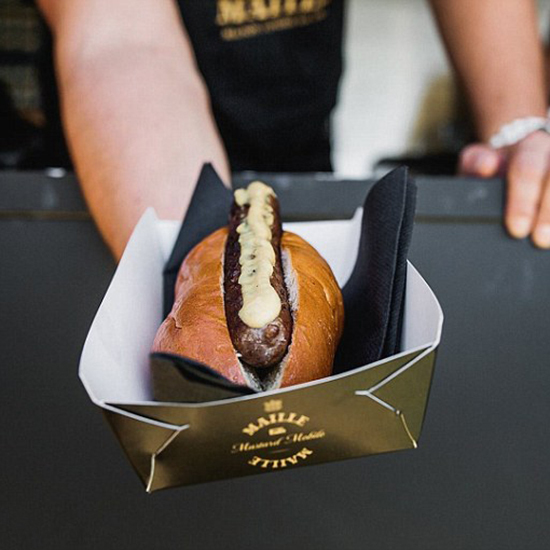 This extravagant purchase, which Maille is calling a "haute dog", is made with grass-fed Australian angus beef and topped with 1747 Dijon black truffle mustard. As Maille representative Joe Barrs told Mashable Australia, "It is a very tasty, very sought after mustard. We had a tub of it air freighted to us about a month ago ... and we've sold out." Bonus goodies with your absurd purchase: you get a pot of 100ml of the mustard, itself valued at $100 AUD and only sold at a few places around the world. The haute dog also comes with a glass of white wine to wash it down. Are you a big spender but not actually that big a spender? The Maille truck also offers a $25 AUD (about $18.60 USD) dog topped with a Chablis white wine mustard, jars of which sell for $30 USD a pop. Or, for the almost sensible hot dog buyer, you can get the $10 AUD dog topped with regular Maille mustard.